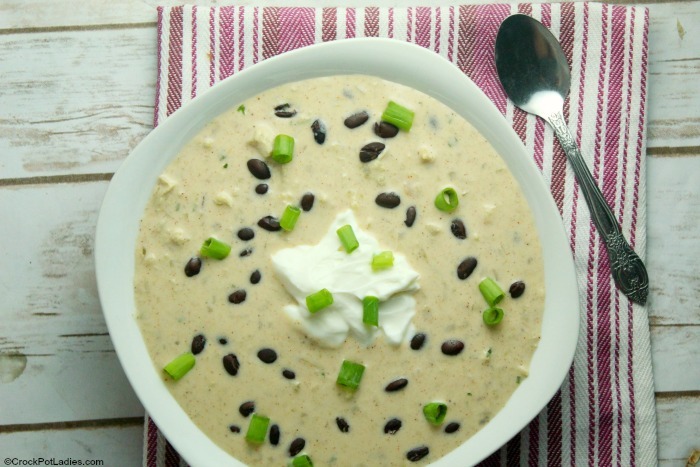 This easy recipe for Crock-Pot Green Chili Chicken Enchilada Soup is simple & delicious! Top with cilantro or green onions, sour cream & fresh lime juice! We use fat-free cream cheese to lighten it up and make it healthy making it just 1 Weight Watchers SmartPoint per generous serving! I love a good creamy soup but since I am on Weight Watchers I know just how many points can be added to soups to make them creamy. Enter fat free cream cheese (I use Philadelphia brand) and you can get that creamy texture you are craving without a bunch of added fat. 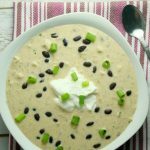 This green enchilada soup is super easy to make with barely any prep-time involved. Just add your boneless skinless chicken breasts to the slow cooker, open a couple of cans of beans (drain and rinse those) and green enchilada sauce, measure out a few spices and let things cook away for several hours. Once the chicken is cooked pull it out and shred the meat. Then add some fat free cream cheese (you can of course use regular full-fat cream cheese if you are not watching your waistline) and let it get melt-y in the slow cooker. Then all you need to do is stir that melted cream cheese into the soup and you have something warm and creamy and delicious! I like to top individual bowls of soup with a little fresh cilantro (or green onion for those that think cilantro tastes like soap), sour cream (or fat free Greek yogurt) and a squeeze of lime juice which just brings a pop of flavor and takes this soup over the moon! This recipe makes a generous 8 servings. But leftovers heat up well all week long so you can have easy to warm up 1 point soup for lunch all week long! Filled with chicken and green chilies this easy to make soup tastes fantastic when you top individual servings with a little fresh cilantro or green onion, sour cream and a squeeze of fresh lime juice! 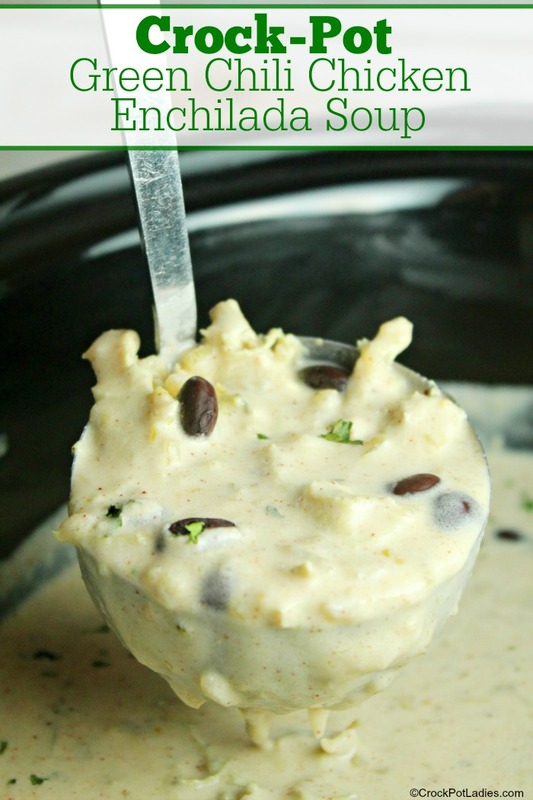 Add all ingredients except cream cheese to a 5 quart or larger slow cooker. Remove cooked chicken from slow cooker and place on a plate or cutting board. Shred chicken meat using two forks and add back into slow cooker. Add cubed cream cheese to slow cooker and recover with lid. Allow cream cheese to fully melt for about 20 to 30 minutes and then stir to distribute melted cream cheese into soup. Question anyone else’s soup turn a black color from adding black Beans in the beginning as directed ?? Hi Salky, I am sorry your soup turned a black color from the black beans. Did you drain and rinse them before adding them to the slow cooker? 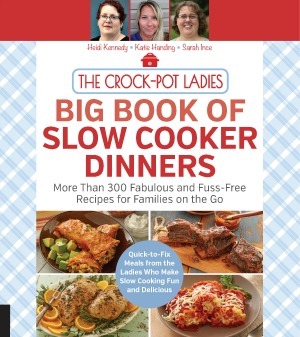 This was one of the best soups I have made and I am still learning to cook with crock pot. My wife is sight impaired so I am taking on the task and as long as I can cook and please her, I’ve got it made!!!! I’m looking forward to more of these great recipes to cook for mi esposa!! Thanks so much Bruce for the kind words. I am so glad you and your wife enjoyed this soup! Blessings to you for learning and taking on the task of cooking. You wife is a lucky lady! Hi Claire, the serving size of this recipe is 1/8th of the entire recipe. We don’t measure out the serving sizes on our recipes. Is the nutritional value for one serving? I’m coming up with 7 points when entering the nutritional information into the weight watches calculator. The total points for the entire recipe is 10 points divided by 8 servings is 1.25 points per serving. However WW rounds that number down to 1 point per serving. Thankyou. Was getting a different number using the nutritional values in the calculator! Can’t wait to try! You’re welcome Vicki. I hope you enjoy the recipe!